This is a homey recipe that brings together the classic combination of mushrooms, brandy, cream and chicken — only I use pheasant breasts here. 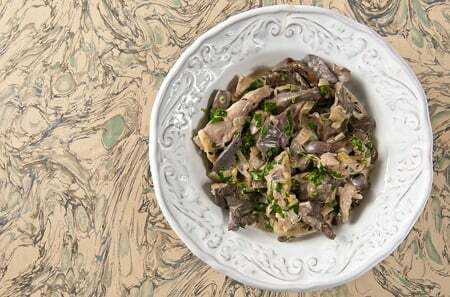 I also make this recipe with wild blewit mushrooms, but as they are very close to the regular cremini or button mushrooms you buy in the store, go ahead and use them if you are not a mushroom hunter. There is nothing that is not to love in this dish: The sauteed mushrooms have a dense, almost crunchy texture, thyme has a natural affinity for all mushrooms, cream and butter provide richness, brandy a sophisticated aroma and the pheasant sings a hearty, meaty harmony with the mushrooms, which are the star here. Pour the stock into a small pot and boil it down until you have about 1/4 cup. Set aside. Slice the mushrooms into large pieces. Heat a large saute pan over high heat for 2 minutes. Add the mushrooms and shake the pan to keep them from sticking. Dry saute the mushrooms for several minutes, shaking often, until the mushrooms give up their water. Cook until that water is almost gone. Add the butter and shallot and toss to combine. Saute, stirring often, until the shallot is translucent and the mushrooms begin to brown. Sprinkle the thyme and a little salt over everything and mix well. Pour in the brandy and use it to scrape up any browned bits on the bottom of the pan. Turn the heat down to medium-high and cook until the brandy is almost gone. Add the reduced stock, the cream and the pheasant strips and toss to combine. Bring this to a gentle simmer, turn the heat to low and cover. Cook like this for 5 minutes, or until the pheasant is just barely cooked through. Toss the parsley in and serve with crusty bread, egg noodles or mashed potatoes or parsnips. The best of all recipes for pheasant in cream sauce! I added black pepper in honor of my mother’s recipe. Thanks for posting this delicious recipe! Yay for blewits! Not really talked up, but one of my big hearts. I do a mushroom version of New Orleans BBQ shrimp with them. Basically rosemary, garlic, worcester sauce, and beer or white wine (whatever I’m drinking), with an appropriate, some might say ungodly, amount of butter emulsified in just before serving. Heaven.